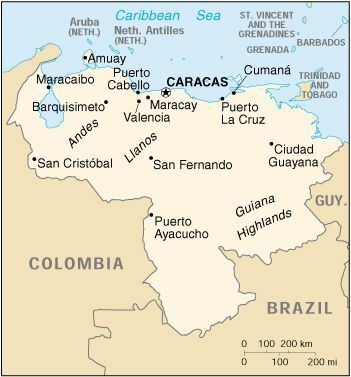 Venezuela was one of the three countries that emerged from the collapse of Gran Colombia in 1830 (the others being Colombia and Ecuador). For most of the first half of the 20th century, Venezuela was ruled by generally benevolent military strongmen, who promoted the oil industry and allowed for some social reforms. Democratically elected governments have held sway since 1959. Current concerns include: drug-related conflicts along the Colombian border, increasing internal drug consumption, overdependence on the petroleum industry with its price fluctuations, and irresponsible mining operations that are endangering the rain forest and indigenous peoples. The petroleum sector dominates the economy, accounting for roughly a third of GDP, around 80% of export earnings, and more than half of government operating revenues. Venezuelan officials estimate that GDP grew by 3.2% in 2000. A strong rebound in international oil prices fueled the recovery from the steep recession in 1999. Nevertheless, a weak nonoil sector and capital flight undercut the recovery. The bolivar is widely believed to be overvalued by as much as 50%. The government is still rebuilding after massive flooding and landslides in December 1999 caused an estimated $15 billion to $20 billion in damage.